In times of austerity it makes sense to do things for ourselves, rather than call in an “expert”. That, of course, deprives the expert of the money, but, you know, people are doing the same to us, so it’s dog-eat-dog. That was the line of thinking when my wife noticed a wasps’ nest under the eaves. This is in one of those Surinamese houses where the living goes on upstairs, while the ground floor is all fresh air and cars. There is a balcony and the bit of roof that keeps the rain off it, the underside of which is called the eaves, apparently. 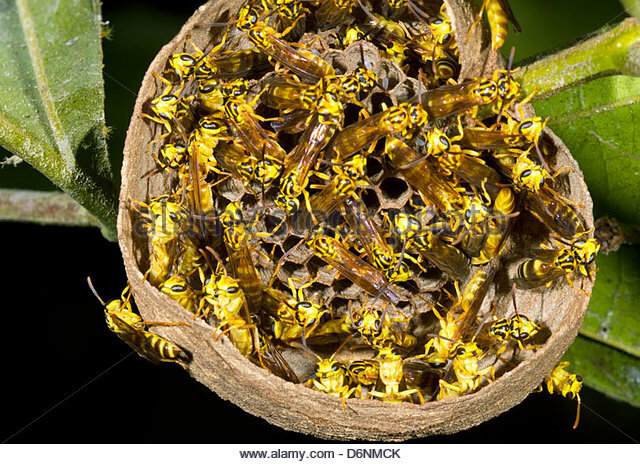 And that is where these wasps have built their nest. But how do we know it’s wasps and not bees, I wonder aloud. And I don’t know how long this nest has been there, but not even a solitary flying hazard has been seen in the house itself. Clearly they’re not interested in looking at the paintings, admiring the settee suite or even checking out the fridge. But such arguments fall on deaf ears. As the official jack-of-all trades, this is my responsibility. The first resort in this day and age is to look it up online. All the advice I find is based on the hazards, not of having a nest under the eaves, but of getting rid of it. Cover up, long sleeves, a hat, gloves and goggles. If it’s in an inaccessible place that you can’t reach, don’t use a ladder because when they come after you, you’re going to panic and fall off. Better to call an expert. Yes, but that’s probably written by an expert, looking for business. And we’re on an economy drive. More advice. Smoke the wasps out first. What with, a disposable barbecue? Held out on a shovel because it’s somewhere that doesn’t have a handy shelf underneath? It’s surprising what goes through your mind when you’re tackling a problem you’ve never considered before. Do it in the evening when the wasps have settled down. At last a sensible suggestion. So, the options: take a broom and knock it off, then make a run for it back into the house and slam the sliding door shut. Poke mothballs in through the entrance? A local chancer once tried to talk me into letting him put mothballs around the edges of the garden to keep out the snakes, charging me a lot of money per ball. But he also told me the woman across the road had just died of malaria and all in all I didn’t believe a word he said. One online bright-ideas merchant suggests spraying glue in the nest, but there are problems with that. The entrance is on the outside, so even if it was closer, you’d be working on something you couldn’t see. And spray glue? I haven’t seen that for years. Then the brainwave hits the shore. Downstairs there is a hose for watering the garden or washing the car. Upstairs at the back is the shower, where there is a tap similar to the one downstairs, which you can screw an attachment to. Measure the distance from shower to balcony; check hose. It should reach. I feel like an RAF boffin during the Second World War, plotting an attack on a German munitions factory. By golly, George, a hose! That just might do it – and it’s the last thing they’ll be expecting. Trial run. It is just about long enough. I leave it there – they’ll never notice – and will do it at sundown. As the shadows fall across the patch of weeds and the odd flower at the front, I lure the dog into a room at the back so he doesn’t get in the way. Turn the tap on and tiptoe out onto the balcony. Shoes on but no protective gear because after all, it’s hot around here. Pull the hose as much as I dare without dislodging it from the clip attached to the tap. The water pressure’s not too good, so I can spray the nest but can’t blast if off. How do they attach it there upside down, anyway? Must be wax. I give it a good soaking and there is a mass exit, but they fly away from the water and therefore from me. After a while the bottom of the nest breaks off, soaked and heavy. We turn the bomber around and head back to Blighty. Next day there is great activity up there. They don’t know when they’re beaten. Trying to rebuild it. We’ll have to go back tonight, George, and do it all over again. Meanwhile, let’s chuck some buckets of soapy water at it. As dusk falls once more, day two of the campaign follows the same routine. Get as close as you can but this time keep adjusting thumb position to get a good solid stream. Keep it up for longer than yesterday until parts of the nest are hanging down. The tenants have dispersed, so I slide the broom along and flick the thing off. Hero? Heartless villain? Bully? In a foreign land you never know what you’re up against. Just doing my job.